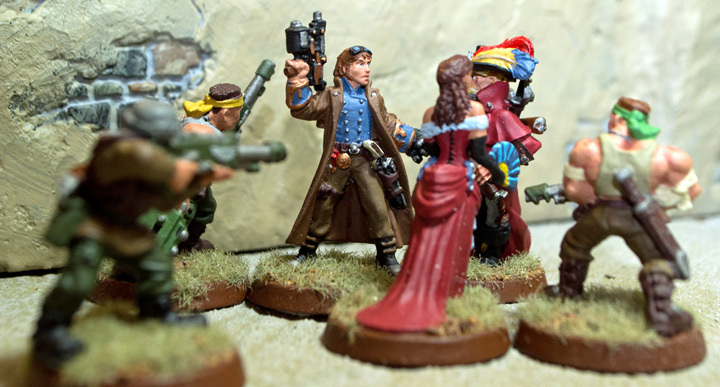 Rogue Trader Adeon Drake finds himself in a tough fix after being ambushed by Count Johaan Feracci and Lady Adriana. Read details of this scenario: CLICK HERE. Drake has been offered the opportunity to acquire some xeno technology from an illicit trader who seeks to smuggle the goods to Belliose III. So Drake needs to cross town to the tavern where the trader is waiting. What he doesn’t know is that the trader initially approached Count Feracci. The nobleman didn’t feel like taking the risk (he’s got enough money and trading in xeno goods is a capital offense), so he recommended Drake for the job. That way, Feracci knew when and where Drake could be found. Why does he want to know? Feracci simply wants to ruin Drake’s day. 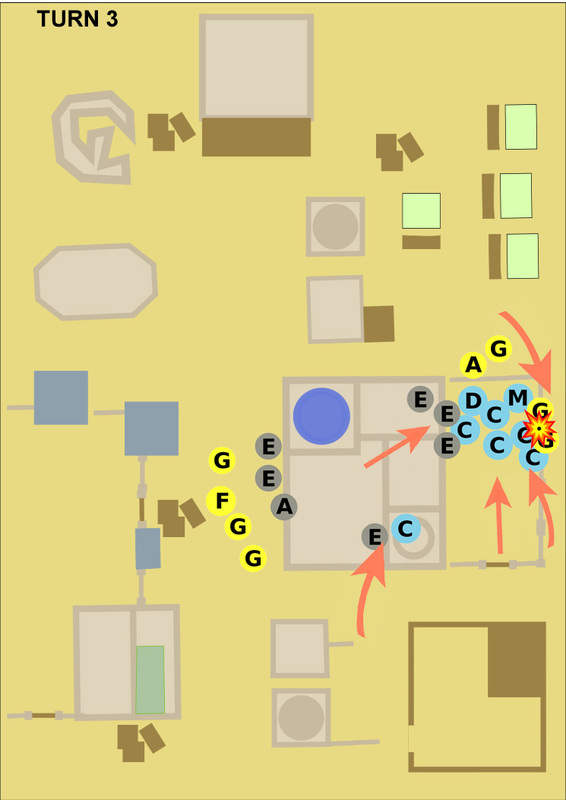 Details of this scenario are available at Scenario: Ambush on Morkai. OUR HERO: Adeon Drake; his second-in-command, Titus Marbray; six crewmen. 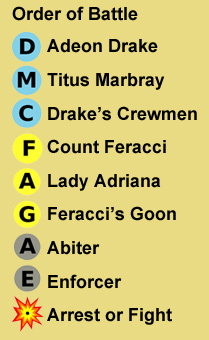 THE BAD GUYS: Feracci, Lady Adriana, six goons. THE LAWMEN: Arbiter; six Enforcers. All figures were equipped with an easy-to-conceak las pistol and some form of melee weapon. Lady Adriana also was armed with a poisoned hair pin (and who knows what else). Drake or a crewman must reach the illicit trader on the north side of town. 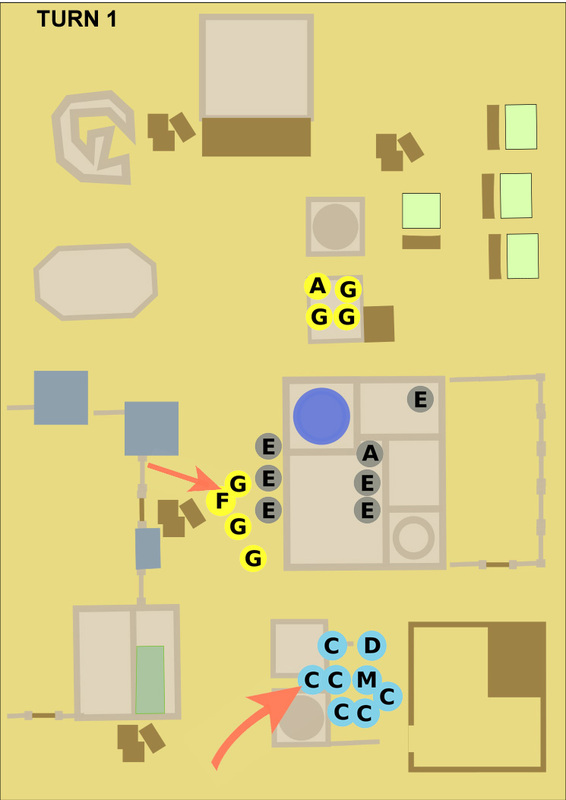 At the end of any turn adjacent to the trader, a figure acquires the “goods” to be smuggled. Then the items may leave the table along any table edge. Feracci seeks to kill Drake–or at last see him in jail. The Arbiter simply wants to maintain the peace. There are special rules for this mission, including the use of Special Event cards from another game. (Heresy!) Full victory point conditions can be found at Scenario: Ambush on Morkai. 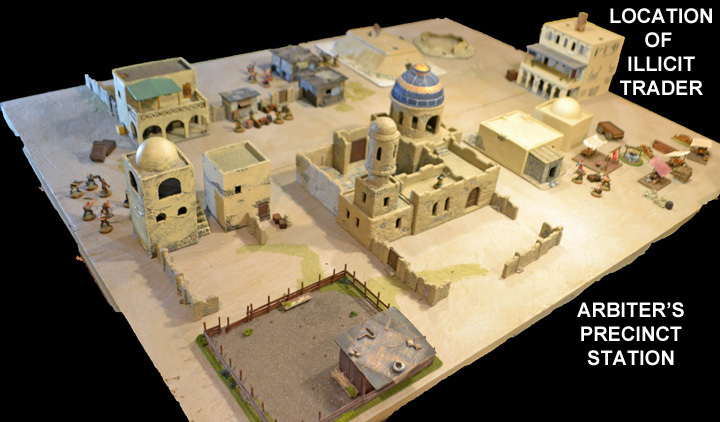 DRAKE: Drake and his crew deployed at the edge of the desert town along the road on the south edge of the table, on the main street leading into town. 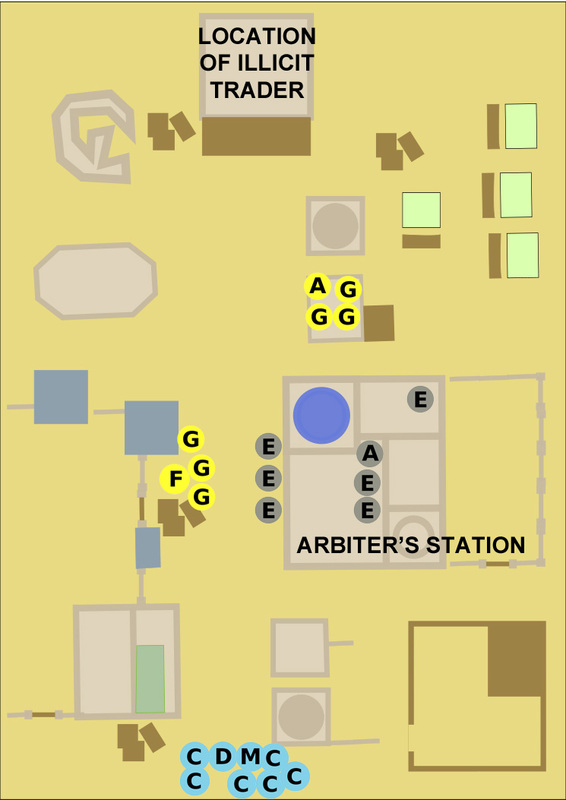 FERACCI: Feracci and half his men deployed on the main street, opposite the Arbiter’s Precinct Station. Lady Adriana and three men deployed in a shop to the north of the Precinct Station. ARBITER: Three Enforcers deployed in front of the Precinct Station. The Arbiter and two Enforcers were inside, while one Enforcer was stationed atop the roof of the station. DRAKE: Spotting Feracci and his goons just up the street, Drake decides to turn into the alley to his right. Once out of sight, he and his crewmen dash across the backyards of the buildings–with the aim of advancing along a narrow alley at the edge of the table. FERACCI: Feracci is in no hurry. He ambles across the street in the general direction of Drake, showing no haste that might alert the Enforcers stationed in front of the Precinct Station. Meanwhile, Lady Adriana and her henchmen continue to wait out of sight inside the shop to the north. ARBITER: Although suspicious, the Enforcers have no legal justification to take overt action at this time. However, they are no fools. Recognizing this influx of strangers is no coincidence, the Enforcer on the roof keeps a close eye out. DRAKE: It occurs to Drake that that the back alley is very narrow–and will create a dangerous bottleneck if he’s caught in it. Maybe turning right was a bad idea. He decides to take a slight detour: He leads his men to the gate of the rear courtyard of the Precinct Station. It’s a bit bold to waltz across the Precinct Station’s courtyard under the eyes of an Enforcer standing on the roof, but, as far as he can tell, he’s breaking no law. Maybe this route will stymie Feracci from launching an early attack. In any case, Drake is feeling the heat of his mistake and needs to take some chances. Two crewmen still make for the back alley. What the heck? But one of Drake’s men is lagging, and an Enforcer turns the corner and spots him running–that’s a “tabletop condition” the GM decides allows the Enforcer to act. So the crewman is ordered to stop. Rather than cause trouble for the rest of his crew, Drake nods for him to obey, then disappears through the gate. One man out of action, Drake realizes. Meanwhile, one of Feracci’s goons sends a voxcast to Adriana, warning her of Drake’s attempt to outmaneuver Feracci. She orders her men out of the shop. Now that she knows where he’s going, she will move to intercept. Forget any ambush. She wants a fight! ARBITER: The Enforcer on the roof sends a voxcast warning of intruders in the back yard. In the front of the building, the Enforcers attempt to discern why a Belliose nobleman is bothering them. Feracci’s bombastic talk is having its effect–he’s keeping three Enforcers occupied at no danger to himself. He’s also attracted the attention of the Arbiter, who heads to the front door. As already noted, one Enforcer moves to the edge of the building and spots one of Drake’s men running down the alley. He takes the crewman him into custody for interrogation. DRAKE: Drake is really feeling the consequences of his decision to turn right. The tall wall that encloses the Precinct Station is a serious physical obstacle to his movement. The wall’s height not only requires him to spend a turn crossing over, but it serves no value as a defensive position. He can’t shoot over it, so he’s stymied from using his superior numbers to open fire on Adriana. This gives gives Adriana a chance to prepare her defense. Still, there’s no time to turn back. Drake boldly runs across the yard to the far wall. He’ll climb over it in the next turn, and with the Enforcer’s visibility blocked (hopefully), he’ll try to physically manhandle Adriana’s men with fists and brass knuckles. The two men in the alley, realizing that they’re in danger of being cut off, decide to abandon the alley. They clamber over the wall and into the Precinct Station yard. FERACCI: Using his social status as a Belliose nobleman to full ability, he continues to distract the Arbiter and Enforcers. Meanwhile, Adriana sets up on the north wall of the Precinct Station Center and waits. Two of her men charge down the back alley, clamber over the wall after Drake’s men, and attack. One of Drake’s crewman is hurt, but so is one of Adriana’s men. The fighting raises an alarm from the Enforcer on the roof. ARBITER: Drake’s man—the one detained in the alley—is escorted to a cell. 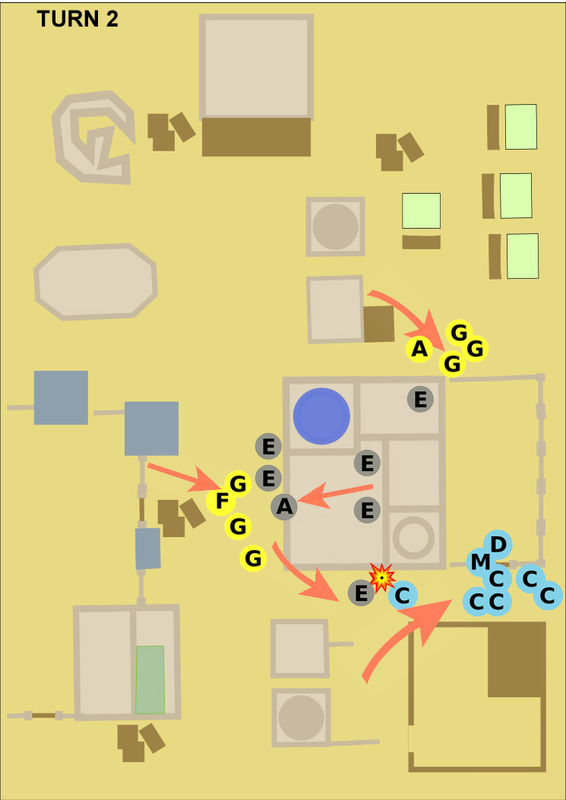 Two Enforces exit from the back door, observe the fighting, and rush to arrest all involved. With so many armed men around, however, the Enforcers target only those involved in the fighting. They loudly proclaim that “you four men are under arrest,” implying that, if left alone, the rest can depart peacefully. Drake decides to take them up on that. Two of his men are out of action, but so are two of Feracci’s. Given the bad tactical situation he’s in, he’ll take an even trade. Besides, why get into a shooting match with well-armed, well-trained, and well-armored Enforcers. Bad business. So what if two of his men cool their heels in jail? That’s what bribes are for. Click here to read Ambush on Morkai (Part 2).